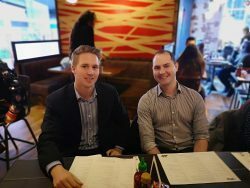 The Exeter based Young Professionals Network (YPN) offers members a chance to network with like minded professionals on an informal basis. The network was set up by Gilbert Stephens in 2010 to provide the firm’s younger members to build their own network of contacts in the Exeter area. The group has grown annually and now has over 300 members from industry, professional services and the charity sector. The YPN is different to other formal networking groups as the atmosphere is relaxed and informal. 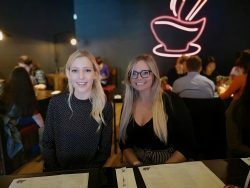 What makes the events extremely popular with younger professionals is the alternative option to building professional and personal relationships outside of the more traditional business networks. Wherever possible the group aims to support, through their events, new businesses in the local area. Events are typically announced 2 -3 weeks prior to the event taking place. 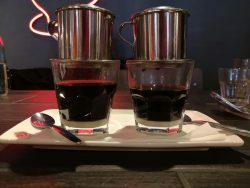 The previous events have varied from cocktail making, bowling, laser tag, the art of sushi making to trying the menus of some of Exeter’s latest restaurants and informal drinks events. Simply contact us via one of the methods below to register. Membership is free and confirmation of acceptance of membership will be emailed to you. Once you have received confirmation, you will be emailed invitations to our events. 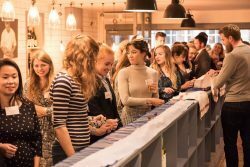 “Such a great organisation for young professionals in the Exeter area. Every event I have been to has been fun, well organised and a great way to network”. Adelle Moore, Graduate Surveyor, JLL. “I heard about YPN a couple of years ago through a friend who had been to some events. I decided to give it a go, even though I wasn’t sure if my area of work would “fit in” with everyone else’s. This was definitely not a problem though as everyone was welcoming, friendly and interested to find out about others and what they do. I’ve changed jobs a few times since joining, from teaching to administration to self employment and have met people from various professional backgrounds that often, in some way, link to my own. The events I’ve taken part in with YPN have been so varied, for example cocktail making at Artigiano, a behind the scenes demonstration at Yo Sushi, a chocolate making class, openings of new bars and restaurants around Exeter with samples of food and drink and many more! It’s really fun to enjoy these activities with the people I have got to know and the new people I meet through YPN”. 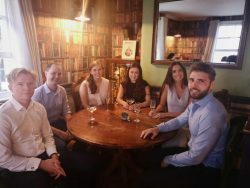 Some of our Young Professionals Network (YPN) team enjoyed an evening with a difference last month thanks to Brewin Dolphin. The Bonkers Conkers event hosted at Lloyds Kitchen in Exeter, was their annual conker championship. 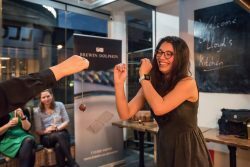 It proved to be an entertaining – if a little competitive – evening of conker battles and gin! Though sadly our team didn’t retain the King Conker Trophy, they did at least come away uninjured and are already looking forward to next year’s event. 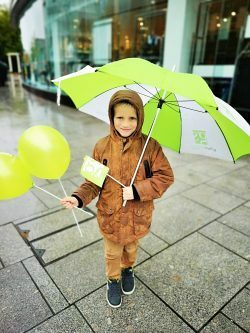 Here’s a few photos of the event, we’ll get practising our technique for next year – if you have any tips then do pass them our way. Want to join in with our Young Professionals Network? Then get in touch. We host and attend events throughout the year offering our members a chance to network with like-minded professionals on an informal basis. 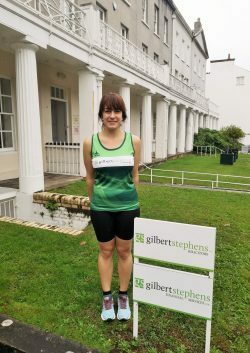 We are very proud of Antonia D’Alessio, Cheryl Bolt and Sarah Heath from Gilbert Stephens Solicitors, as they took part in Exeter’s Great West Run 2018 on Sunday 14th October. 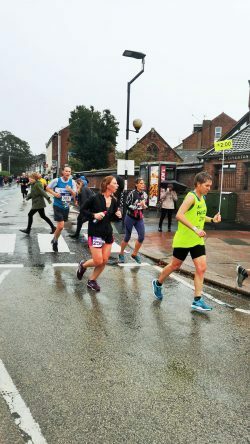 The Gilbert Stephens Great West Run Trio did really well, with Antonia finishing with the time of 1 hour 59 minutes, Sarah in 2 hours 2 minutes and Cheryl finishing shortly after in 2 hours 24 minutes. 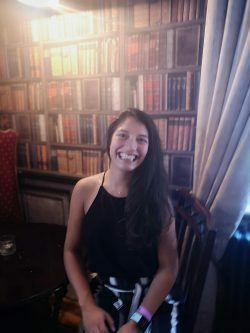 Antonia recently wrote a blog about her training over the last few months and it’s safe to say that their dedication to their training and chosen charity, tackling period poverty, has been exemplary. 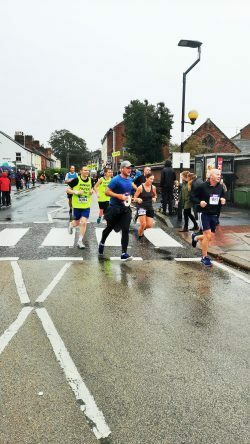 Thank you to everyone who took part in and organised this special event for Exeter, and thank you to everyone who came out to line the track and encourage our city’s runners as they raised money for causes close to their hearts. Next year, the Great West Run will partner with charity Macmillan Cancer Support. Early bird tickets are open now – perhaps we will see even more of our team out training in the run up to next year? 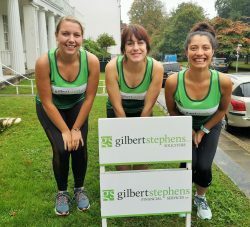 Sarah, Antonia and Cheryl are all taking part in the Exeter Great West Run tomorrow. Good luck to the Gilbert Stephens Great West Run Trio! When I was asked to attempt the Great West Run, I laughed. I am not a strong runner and my technique leaves much to be desired. Ballet is definitely more the sport for me. However, I took up the challenge, so thought perhaps I’d try a few smaller 5k runs and then see how it goes. 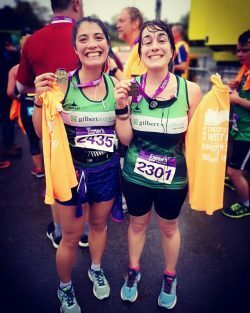 A few of us from Gilbert Stephens took up the challenge together, and we began to run at lunchtimes, running the scenic route to the Double Locks and back (unfortunately not stopping for a pint on the way – however tempting it was). This is a nice flat route and we started running it with ease, forgetting about the countless hills around Exeter! Building up miles we began to pick up a little speed on the 5ks and began mixing it up with sprints, hills and a few extra miles. Running was exhausting in the heat we had this summer and we began to try and fit our sessions in after work when it was cooler… obviously followed by an ice-cream!! 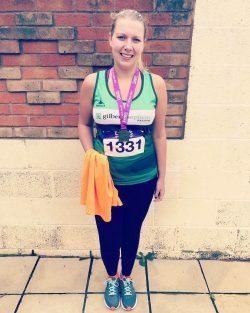 When we did our first 10k run, we felt fantastic, and proud of completing it in 56 minutes! We then moved on to an 8-miler, completing that in under 1 hour 30 minutes, and then onto 10-milers in under 1 hour 50 minutes. I hit a slight snag on one 10-miler when my knee decided to give way. I hobbled home to a frozen pack of peas. After giving my knee the rest it needed for a week I ran a couple of shorter runs to build it back up and I’ve been careful with it ever since! When I had recovered enough we began to pick up the longer runs again. We were building up speed! It’s amazing what listening to ABBA does to your motivation! Now the race day looms ahead. We are beginning to taper our runs ahead of the big day. Eating healthy, no alcohol (including that post work glass of wine) and lots of stretching. It’s safe to say we are all very excited and a little scared for the big day! 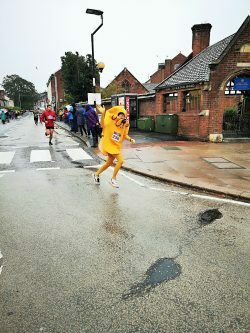 We have decided to run this race in aid of preventing period poverty – collecting sanitary products for a charity that donates to women who cannot afford the items themselves. We have collected a fair few items so far and have already filled two boxes! 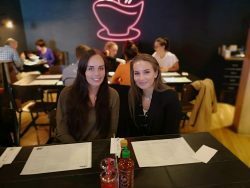 The Gilbert Stephens Solicitors Young Professionals Network enjoyed some excellent Vietnamese cuisine at Pho Exeter for lunch yesterday. 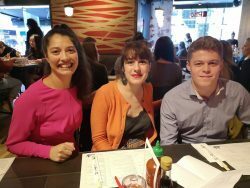 I have written a couple blogs about my journey so far as a trainee solicitor but I think it’s interesting to look at how I got to this role, so this blog focuses on how to become a solicitor. 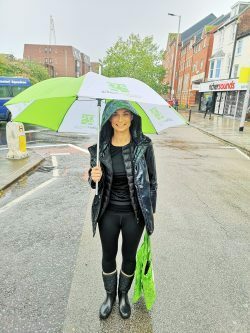 What I think many people may not realise is that someone who is a “solicitor” is a professional person who has undertaken the various legal studies and training requirements and is appointed by the Solicitors Regulatory Authority as a qualified solicitor. Whereas the phrase “lawyer” does not necessarily mean that the person holding themselves out to be one has any legal qualifications or experience and it is important when choosing legal representation that people are aware of this key difference. In order to become a solicitor you have to first undertake a degree. I undertook a qualifying law degree at UWE in Bristol which took 3 years full time to complete. However, you can still become a solicitor even if you have not completed a law degree. You simply need to undertake a Graduate Diploma in Law (GDL) to convert your current degree to a law degree. This course takes 1 year full time or 2 years part time. Once you have completed your undergraduate studies you then need to complete the Legal Practice Course. This course can be done full time over 1 year or part time over 2 years. Usually people tend to undertake this course straight after completing their degrees. I completed mine part time over 2 years as I was also working full time at Gilbert Stephens during this time. I found that working in a law firm really helped reinforce the teachings of the Legal Practice Course. The course teaches subject areas that relate to being in legal practice, such as accounts and drafting. My firm was very accommodating with time off for studying and exams. I found that most of the people on my Legal Practice Course were also in the same situation, already working at law firms, and most of them had similar experiences with their firms being accommodating to the needs of the course. Shortly after completing the Legal Practice Course I then began my role as a “trainee solicitor”. And whilst I had hoped that all my time spent studying was over I still had to complete the Professional Skills Course. This course attended by Trainee Solicitors is spread over 12 study days and includes 1 exam. The lecturers, who are qualified solicitors or barristers, teach a syllabus to reinforce the principles of client care, code of conduct and money laundering to name a few of the important principles of being a solicitor. 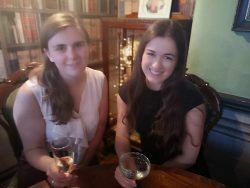 The course, which highlights included a very nice lunch at Reed Hall in Exeter, gave me the opportunity to socialise with fellow trainee solicitors who are mostly local to the area and share our experiences as a trainee so far, many of which were very different! I have now completed the Professional Skills Course and whilst I am very glad to finally have completed the educational side of training, which has spread over the course of 5 years from starting University, I will still need to find a new challenge to keep my brain active as I still love learning and attempting new things. 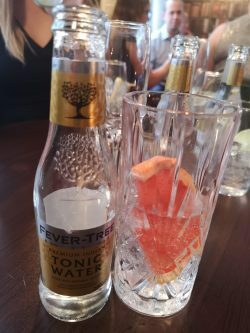 The Gilbert Stephens Young Professionals Network (YPN) enjoyed a wonderful evening of gin tasting at Crocketts Gin Bar on 5th July. The event included a presentation from Cheryl Bolt who launched her exciting new Gilbert Stephens blog. 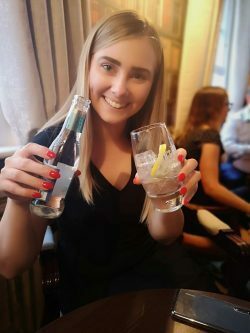 They were joined by the Crocketts Gin experts who talked them through a variety of Gins on offer, and of course there was plenty of time for some gin tasting! 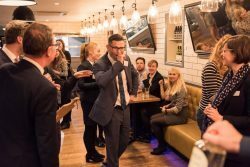 The Exeter based YPN meet regularly and offer members a chance to network with like-minded professionals. 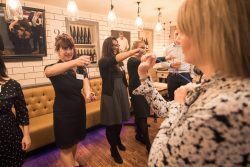 Different to other formal networking groups, the YPN ensures the atmosphere is relaxed and informal. 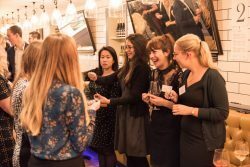 What makes the events extremely popular with younger professionals is the alternative option to building professional and personal relationships outside of the more traditional business networks. Time for my second blog! Given that I am currently in the Private Client department completing my second seat I thought it would be interesting to base my blog on this. Private Client work ranges from preparing Wills and Lasting Powers of Attorney to administering estates when someone passes away or dealing with a variety of trust work. 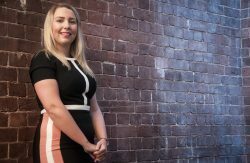 I had hoped to gain experience in this area of law as Private Client work can be very personal and I wanted the opportunity to be involved in close client matters. I get up to all sorts being a trainee in this department, from drafting Wills and court documents to assisting in house clearances! I also get out in the community by attending house visits with my supervisor which creates a nice change of scenery from the office but also highlights the importance that everyone should have access to legal services and some of our more elderly clients that we attend at home would not be able to access these otherwise. I have also been luckily enough to move to our Sidmouth and Budleigh offices to undergo my training in this department. Both offices are located in beautiful coastal towns which means that I can sit by the seafront on my lunch. Well when the weather is nice! What I have found most interesting so far is the importance of creating a Will. Statistics show that over half of the people in Britain do not have a will. If you do not have a Will when you die then the distribution of your estate is determined by the rules of intestacy. It’s important that people obtain advice on this as the standard rules of intestacy may not be their intention on how their estate is to be distributed. But without a valid Will to state otherwise the intestacy rules will stand in its place. Another problematic rule of intestacy is that there is no provision for a surviving partner who is not a spouse or civil partner. This means couples who were in a relationship and or living together, whether for 1 year or 50 years do not have an automatic right to benefit from their late partners the estate. I have already learned so much from my seat in the Private Client Department and am looking forward to the rest of my time here, meeting with clients and perhaps enjoying the odd ice cream on the seafront during lunch. As a trainee solicitor I am required by the Solicitors Regulatory Authority to undertake a period of recognised training (more commonly known as the Training Contract). I am very fortunate that Gilbert Stephens offered me a training contact as these are traditionally very competitive with not many places on offer. I had been with Gilbert Stephens for 3 years before beginning my training and as the firm hadn’t had a trainee in over 4 years they certainly put their faith in my abilities by agreeing to provide a training contract. The period of training usually consists of training in four distinct areas of law, each known as a different “seat” of the training contract. One of those areas must be contentious, meaning relating to an area of law which is contested. My first was my contentious seat in our Litigation Department. Litigation is a term used to describe proceedings initiated between two opposing parties to either enforce or defend a legal right. Each of our litigation fee earners have expert knowledge of specialist areas of civil disputes. I was very fortunate to be able to spend my time in the Litigation Department shadowing each of our litigation fee earners. I gained valuable experience in a wide range of specialist civil matters such as employment law, personal injury and debt recovery to name a few. Some of the core areas of law, such as contract law and tort, were familiar to me from my law studies and it was very interesting to see how these core areas of law are applied in practice. The area that interested me most whilst in the Litigation Department was employment law. Employment law is a key area of law that affects and ultimately protects anyone who is employed and yet from my experience it seems that many people (both employer and employee) are not in the know about these rights. The most challenging aspect of my time in the litigation department was the court deadlines that we have to adhere to. Whilst many civil disputes become resolved and do not end up in court there are some which do not and ultimately end up going through the court system. When going through the courts, the judges set very strict timescales and deadlines that all parties and their respective solicitors must adhere to, which is challenging to meet whilst also undertaking various other work. Whilst television programmes like Suits focuses on the American legal profession, these shows tend to glamorise the idea of going to court and it certainly does not happen like that in practice. The lead up to Court is very time consuming, hours of preparation are needed to prepare the court bundles. Court days can be very long, with little time for breaks, and can go on past normal working hours – although luckily I only had to experience this once whilst in the litigation department! I certainly enjoyed the variety of challenging work the litigation department provided me. From gaining experience in critically drafting (some rather long) letters of claim to researching guidelines on the compensation levels for injuries in order to quantify in money’s worth the damage caused it is safe to say that not one day was the same in litigation. 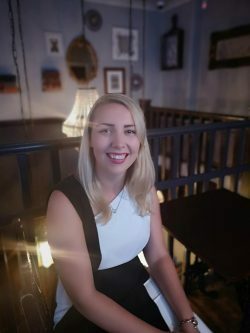 Cheryl Bolt our trainee solicitor at Gilbert Stephens is launching a blog about life in the young professional world and is looking to engage others at a similar stage in their working lives as well as helping people to understand what goes on behind a solicitor’s door. Cheryl’s introductory blog will be about her time so far with Gilbert Stephens and subsequently she’s planning monthly updates on what she’s been up to. She will also focus on different departments within the law firm. 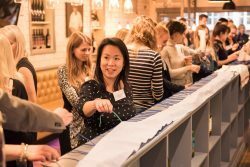 The Exeter-based Young Professionals Network (YPN) offers members a chance to get to know like-minded professionals across a range of businesses and services in an informal setting. The network was set up by Gilbert Stephens in 2010 initially to provide the firm’s younger members with their own network of contacts. Since then it has grown and now has more than 300 members from industry, professional services and the charity sector. They meet regularly for various activities, ranging from making sushi to ten pin bowling. Cheryl’s blog will be published on the Gilbert Stephens website and shared on their social media – be sure to follow to keep up to date. 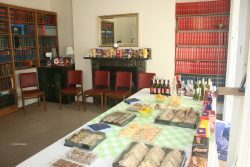 11 April 2017 – Easter Drinks at Gilbert Stephens LLP, Southerhay East Office. 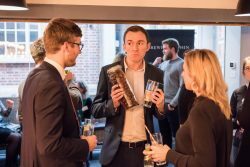 On Tuesday 11th April 2017 the GS Young Professionals Network hosted an informal Easter drinks evening at their office in Southerhay East, Exeter. The event was held slightly earlier in the week than normal to cater for members taking an extended break over the Easter holidays and over 20 members attended. The Gilbert Stephens library felt very ‘Spring like’ as Easter Eggs adorned the mantelpiece and the mood was upbeat and jovial with talk of everyone’s plans over the Easter weekend – and of course local business matters. This month YPN members took a break from their busy schedule to enjoy a hearty breakfast at Tea on the Green. Due to the location, the view of the aftermath of the Royal Clarence Fire could not be avoided as members enjoyed their breakfast. This incited much discussion on the current proposed plans for the restoration of the building and there was a general consensus that the building should be restored to its former glory and everyone was excited to hear that a proposed further storey is also to be erected. 22 February 2017 – Tenpin bowling at Haven Banks Retail Park. 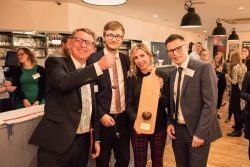 Gilbert Stephens LLP laid down the gauntlet to their Young Professionals Network by hosting a ten pin bowling competition at Haven Banks Retail Park on 16 February 2017. 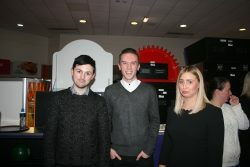 All teams who entered showed a competitive streak and Luke Kitteridge, IT Assistant at Gilbert Stephens stole the show by winning both games. Mat Bennett from Bishop Fleming accountants and Rachel Philips of Frosts Estate Agents in Exeter, both showed good form when coming in as joint runners up. 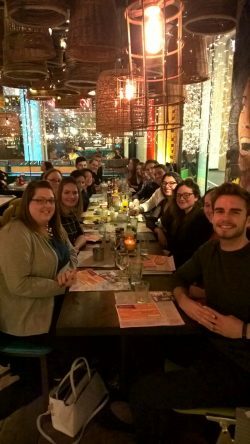 The YPN hosted a successful dinner at Turtle Bay in Exeter’s Guildhall. Attendees were in good spirits following the seasonal break and we were pleased to welcome a number of new members. Our final event of 2016, the annual drinks evening was help on Tuesday 29th November, from 5.30pm onwards, at our Southernhay East office in the Library to celebrate the festive period with plenty of mulled wine and mince pies. 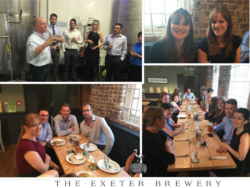 Members of Gilbert Stephens’ Young Professionals Network (YPN) recently hosted a tasty networking session at Exeter Cookery School, one of the region’s hottest new culinary destinations. Having been handed three recipes by the school’s head chef and tutor, Jim Fisher, the group was divided into teams and then let loose on the kitchen to create three festive canapés. 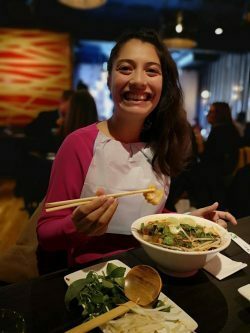 Despite the look of sheer panic on some of their faces, with a little encouragement everyone was soon prepping like pros and surprised themselves by creating a veritable feast for the evening. 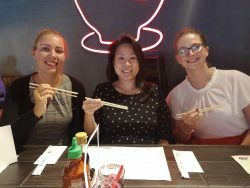 The group of up-and-coming young professionals from various sectors, including legal, accounting and health, enjoy nothing more than meeting up on a monthly basis to socialise with their peers as well as learning new skills. This event was extra special, as it signifies the YPN’s 6th Birthday. 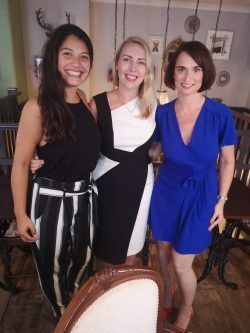 The group has continued to grow in strength since launching in 2010, and is now one of the city’s biggest networking groups, with a membership of over 300. On Thursday 29th September, the YPN held their September event at Urban Underground, Urban Burger’s underground cocktail bar. 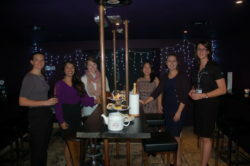 The event was arranged in conjunction with Urban Underground’s launch of their “Urban High Tea”. Their twist on the more traditional Afternoon Tea saw members enjoying “tea” inspired cocktails (and mocktails for those driving) from teapots. Last night the YPN held an event at Exeter Brewery. The evening included a 40 minute tour of the Brewery followed by a dinner of pie and mash, and of course an ensemble of beers to taste, all rather tasty. 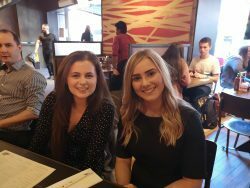 Last night, the YPN hosted an evening at Pizza Stein, a newly opened pizza restaurant on The Quay. With a well balanced mix of both old and new members, a pleasurable, relaxed evening was had by all (bar maybe the restaurant staff). 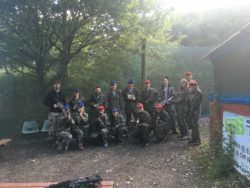 Five new members joined the YPN for an evening of laser tag at Exeter Laser Tag in Longdown, where the red and blue team battled for the ultimate bragging rights. Members attended the newly opened “Board” the board game cafe in Exeter, where they spent the evening playing traditional board games like Scrabble and Trivial Pursuit and niche table top brainteasers like Settlers of Catan and Steam Park, whilst having some food and drink. 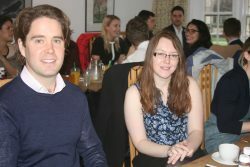 The Exeter based Young Professionals Network (YPN) welcomed 4 new members to its successful networking group at a breakfast event hosted by Gilbert Stephens LLP at Bill’s Restaurant, Gandy Street, Exeter. In attendance were 24 Young professionals from Exeter and the surrounding areas.